Publisher: Pleasant Storm Entertainment, Inc.
Sating that appetite for the weird while supplementing the idea of found footage, Terry M. West and Pleasant Strom Entertainment, Inc. have manifested from dark vaults, Journals of Horror: Found Fiction. 29 uncomforting tales of delusion and terror that will have you locking your doors, checking your phone settings and finding your journal so you can chronicle the onset of madness that may inevitably take hold. 29 authors who were fortunate enough to be released from their own straightjackets to pen some disturbing literature, instead of screaming their tales or spelling them out in missives with their medication. Oh, but enough with the Crypt Keeper treatment, lets open up this dark tome. Anything from sensationalized pulp, to eloquent horror will be found while traveling through these pages. I myself found many of the stories to be entertaining, yet there were few that made me pause my reading and recollect my thoughts. Those were the best tales. There were stories that read like standard weird fiction, and some that read like submissions to Creepy Pasta. However, though these tales are works of fiction, the tales that teetered on the edge of truth were the ones that dragged me in. Some of these entries, for example; West’s “Bagged, Tagged & Buried,” Rolfe’s “Killing Jessica” and Leflar’s “Letter to Grandma,” exhibited masochistic tastes with dashes of schizophrenia and paranoia for flavor which, along with some other minor ingredients, developed a fun psychotic recipe for great found fiction. Bellow is a list of the stories and the authors behind them. Though TCoC isn’t an epistolary formed story like Dracula or Frankenstein, by simply stating that the documents were found and are reviewed (within the story) simply opens the door for use of the term found fiction. 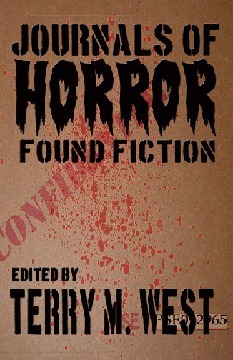 Yet the reason I claim that found fiction would be best suited as a sub genre, is due to the fact that the three classics I mentioned are primarily categorized as horror fiction, or even in the case of H.P.’s story, weird fiction. Any genre can contain the elements of found fiction, though they may not be as potent as a horror setting, they are out there. It took me longer than I originally expected to get through this book, as I am sure it took longer than Mr. West anticipated for me to complete the reading and an honest review in exchange for some pretty thought provoking and unsettling fiction. In that regard I ranked this collection a 3 out of 5 stars. The book could have been condensed to 20 tales and maintained a stronger consistency of quality, and a more digestible overall length of the book. As you may see above I marked, with a *, certain stories as favorites or plots that when looking back stick out the most in my mind. I have more selections from Terry M. West’s library of publications; such as, The Giving of Things Cold & Cursed: A Baker Johnson Tale , What Price Gory? , and Heroin in the Magic Now , along with a couple others. I am excited to dive into those soon and share my thoughts with everyone. If you have checked out Halloween Tales , let me know what you think by leaving a comment. And if you like all the tasty bits we gibber about here, become a follower or submit to receive email updates with every new post! Check us out on Twitter @UnspkbleGibberr and on Facebook at http://www.facebook.com/UnspeakableGibberer. It’s been a long hard couple of years, but since June of 2009, the world has had the H.P. Lovecraft Literary Podcast to make it easier. I mention this because Chad and Chris have hit their 100th episode! Congrats to those gentlemen. In the beginning of the 100th episode the guys talk about what they’ve done to get where they are now and what’s in store for the future. I am excited to see where these two take it and I am sure I will be listening every step of the way. Lately when Chris and Chad do a two part story, or three, I wait till the final episode to post about it. If it goes over three parts I usually cover every other episode. So this week I sandwiched episode 99, and 100 to sum up what went down in one shot. The guys didn’t have a physical voice or guest for this story, but they were able to get some side notes from Michael Reaves. Most people may not know the name, but Reaves is quite prolific. He’s done work for Gargoyles, The New Batman, He-Man, and most notably (especially to me) The Real Ghostbusters. Check out more of his work and what he’s accomplished here. Anyway, the guys were unable to get him on the show, so they read some stuff he wrote for the episodes. Very clever and very sharp stuff from Michael, and I hope to hear, and see more from him in the future. Now im not going to go into too much detail on what the guys talked about in regards to The Thing on the Doorstep, however I encourage all to listen to what these guys had to say about this story. The reader this week is Fred Cross, and he does an excellent job voicing out the distress from characters Edward, and Dan. Though this story is almost a little to incestial, if that’s a word, it has a great undertone that Chad points out as the trouble people go through when losing their identity, and the perversion of others encroaching in on your morals. Also this week listen for the special code for 10% of any order at Miskatonic Books. That deal is going through Valentine’s Day, so get on over and make a couple orders. Again congrats to these guys and I hope to be hearing another 200 episodes as we wind down this cosmically colored path beyond the darkest of the hillside thickets. A special treat! I posted at the bottom the actual episode of The Real Ghostbusters, The Collect Call of Cthulhu, and Cheers! It’s been a while since my last post about these guys. I skipped over posting about “The Call of Cthulhu” reading with Andrew Leman, and decided that on the next episode post I would breeze over it. Great production value, as to be expected, and a great treat to have over Halloween. All of the full readings are now exclusively available on the H.P.L Literary Podcast homepage. This week’s episode was one I have been waiting for a long time. I am a big Randolph Carter fan, and I was excited to get to this one. In some reviews of the tale, I gathered it was another crappy team-up, as Chris calls them, but after hearing both Chris and Chad talk about it, I immediately rushed to my complete collection of H.P. Lovecraft and read it. Good stuff folks. We are blessed again to have the dreamy voice of Lance Holt, from The Dream Quest of Unkown Kadath, and The Silver Key fame. As Lovecraft has progressed, I have noticed a more Science-fiction feel to his work. His descriptions of sounds, lights, and color really grabbed me and at times I felt myself falling through space in sort of a kaleidoscopic worm-hole. Like I said I am a big Carter fan, and I really liked how this story panned out. Yes it was obvious from the start, and from reading reviews, I knew how it would end. Even with those spoilers I never read a perspective that gathered that Carter is an archetype of Yog-Sothoth. Still filling in the plot with all the description and feeling helps prove that Lovecraft is a master of his realm. I would have to agree with the guys that this one doesn’t get enough credit, and hope that someday they produce full readings of all of Carters journeys. Next week, that is if Mr. Lackey isn’t fathering a gibbering spawn of himself, we get another Hazel Heald collaboration, The Winged Death. Read before they discuss and enjoy the madness. I give this story 5 out of 5 stars in alignment.